The Bruins are the defending NHL champs. The Celtics regularly make the playoffs. The Patriots are perennial Super Bowl contenders and the Bosox have won two World Series titles over the past decade. 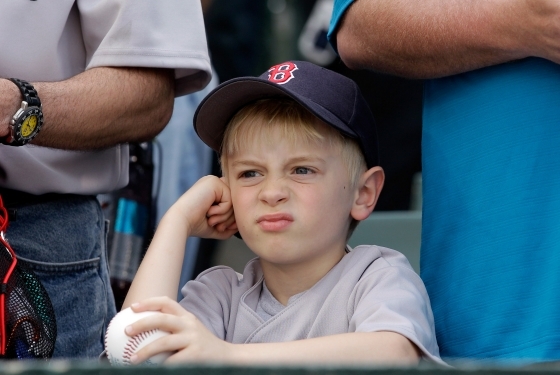 But the entire city has been humbled recently and Sunday was particularly tough on the psyche of the Boston sports fan. Their beloved Patriots lost to the heretofore lowly Buffalo Bills and the Red Sox are teetering on the edge of an epic collapse that would set a new standard for epic collapses. With tongue firmly planted in cheek but sharing the general angst being felt by the city’s sports fans, Boston Globe sports columnist, Dan Shaughenessy, went so far last Friday as to ask the Commissioner of Baseball to disqualify the Red Sox from the playoffs even if they do somehow manage to back into post-season play, saying they just don’t deserve the honor given the horrific way they have played in September. Their brilliant centerfielder, Jacoby Ellsbury, may have saved their season with a two-out, 14th inning, 3-run homer that beat the Yankees last night, but even so, they cling to a 1-game lead over Tampa Bay and the paranoia in Bean Town is palpable. Their starting pitching is in tatters, their dugout demeanor has been deflated and defeated. On Saturday, the horror of this September that they opened with a 9-game Wild Card lead, was in abundant display as Red Sox leftfield bust, Carl Crawford, botched a line-drive out that led to a pair of 2nd-inning runs, followed shortly thereafter by a Derek Jeter 3-run blast that put the Bosox hopelessly behind 6-0. Carl Crawford was supposed to be one of their free-agent saviors after the Washington Nationals unexpectedly stole the guy they wanted, former Phillies outfielder Jayson Werth, in an off-season acquisition. Aside from accidently screwing the Red Sox by forcing them to pick up Crawford, the Nationals have had a good old time over the past couple of weeks derailing hopes and planting doubts in otherwise, really good baseball teams. They took four games from the Phillies in Philadelphia after the Phils had clinched the division. Oh, big deal, you say, the games were meaningless. Yes, but that set the stage for baseball’s best team to go into an 8-game slide they finally ended Sunday. Probably not the way you want to go into the playoffs. And the Nats took two out of three this weekend from the Atlanta Braves who are vying with the Red Sox for an almost equally disastrous National League epic collapse. Getting the last three outs in a baseball game is a famously difficult task. Getting the final victories at the close of baseball’s marathon 162-game season is even more difficult. White knuckles and fear seem to overwhelm the emotions of normally rational and competitive men. For perspective, here in Washington, D.C., we are immensely proud that our baseball team is about to finish in third place in their division. We are ecstatic that our football team has started the season with two victories and we appear to be on the road to a .500 season. For all those Phillies, Braves and Red Sox/Patriots fans accustomed to the rarefied air of constant success- this week in sports is proving that, at the very least, you should be really grateful your teams are even in the position of disappointing you.